Saxophonist Dan Graser is one of the pre-eminent pedagogues and performers of his generation. Following undergraduate study with Tim McAllister at the Crane School of Music and Doctoral study with Donald Sinta at the University of Michigan, Dan recently was added to the faculty of Grand Valley State University where he serves as Professor of Saxophone. 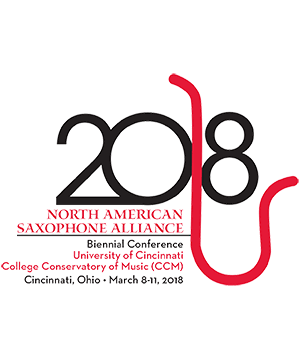 As soprano saxophonist of the world-renowned Donald Sinta Quartet Dan has been fortunate to receive 1st prize at the Mprize Competition, 1st prize at the Concert Artists Guild Competition, the Alice Coleman Grand Prize of the Coleman Competition, and 1st Prize of the North American Saxophone Alliance Quartet Competition. As an orchestral performer Dan has performed with the Detroit Symphony, New World Symphony, and Grand Rapids Symphony uner the batons of Michael Tilson Thomas, Leonard Slatkin, and John Adams. 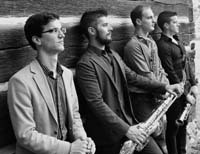 The Donald Sinta Quartet (DSQ) have quickly achieved international renown for their championing of new music, virtuosic completely memorized presentation, and international success on the competition circuit. Formed at the University of Michigan in 2010, the group has received 1st prize at the Mprize Competition, 1st prize at the Concert Artists Guild Competition, the Alice Coleman Grand Prize of the Coleman Competition, and 1st Prize of the North American Saxophone Alliance Quartet Competition. Maintaining a busy schedule of dozens of chamber music series performances yearly, DSQ perform everything from the latest cutting edge music to their own original transcriptions from the string and wind repertoire. DSQ also run an annual national composition competition for students studying in American schools of music. DSQ are selmer artists and perform on Selmer Paris saxophones exclusively. Zach Stern Alto Saxophone A current doctoral student at the Eastman School of Music and a recent graduate from the University . . .
Joe Girard Tenor Saxophone Joe Girard currently resides in Columbus, Georgia where he serves as Lecturer of Saxophone at C . . .
Danny Hawthorne-Foss Baritone Saxophone Prior to moving to Ann Arbor, Danny Hawthorne-Foss was active in the San Francisco music . . .